Daniel Schmid was born to a family of hotel proprietors on 26th December 1941 in the small Grisons town of Flims, Switzerland. In the sixties he studied at the Free University Berlin and attended the German Film and Television Academy in Berlin. He worked together with Peter Lilienthal, Rainer Werner Fassbinder, and Werner Schroeter. 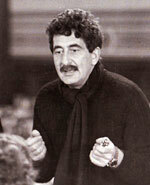 During this period (1971-1980), he also worked as an actor. From 1970 to 2004, Schmid made 15 films, and from 1984 he directed seven operas at the Zurich Opera House and the Grand Thé�tre Geneva. In 1999, he was awarded an Honorary Leopard at the Locarno Film Festival. Due to ill health, he was forced to discontinue shooting his last film. Daniel Schmid died of cancer in August 2006.